I’m quickly becoming a fan of First Second Publishing and their wonderful graphic novels. 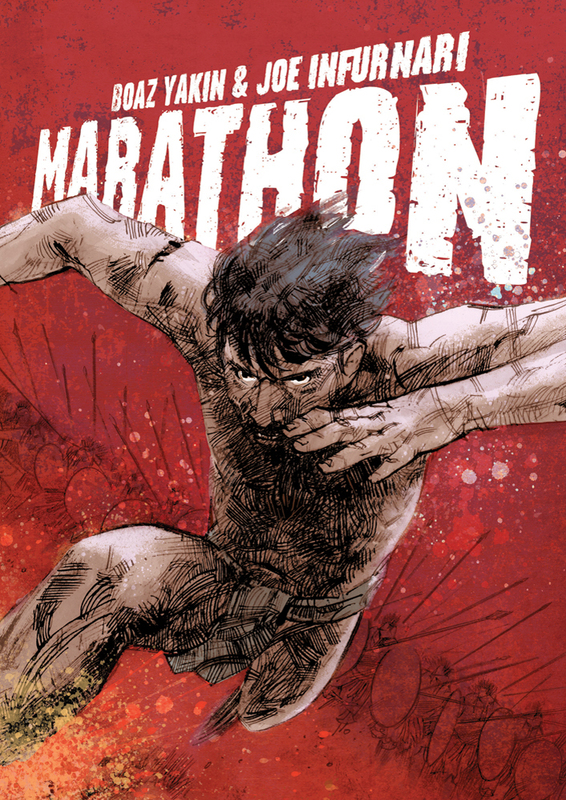 After thoroughly enjoying Friends With Boys I spotted Marathon on their publishing schedule but it looked a little too manga-like for my interests so I skipped it. Then I thumbed a copy at my local comic shop and knew it was a must read. It was a turning point in ancient history. It inspires men to greatness. It was the foundation of one of the greatest and most prevailing global peace efforts of the 20th century. It was the greatest feat—and the tragic death—of a man whose legacy will never be forgotten. In 490BC, an Athenian messenger named Eucles ran 153 miles from Sparta to Athens, and in so doing preserved ancient Greek civilization from subjugation to the Persian Empire. This is his story. 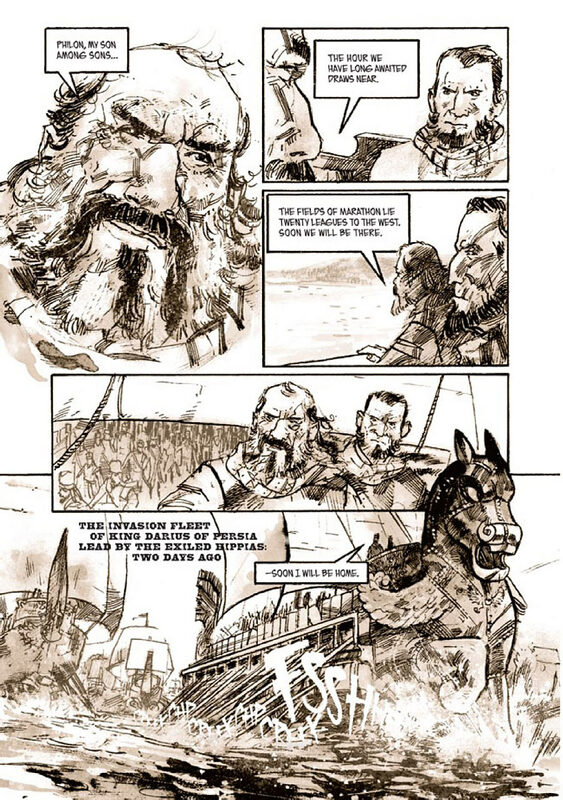 Reading through the description it’s easy to imagine this graphic novel told in about two pages: Eucles runs from Athens to Sparta and back again. Wow, that would be bad. 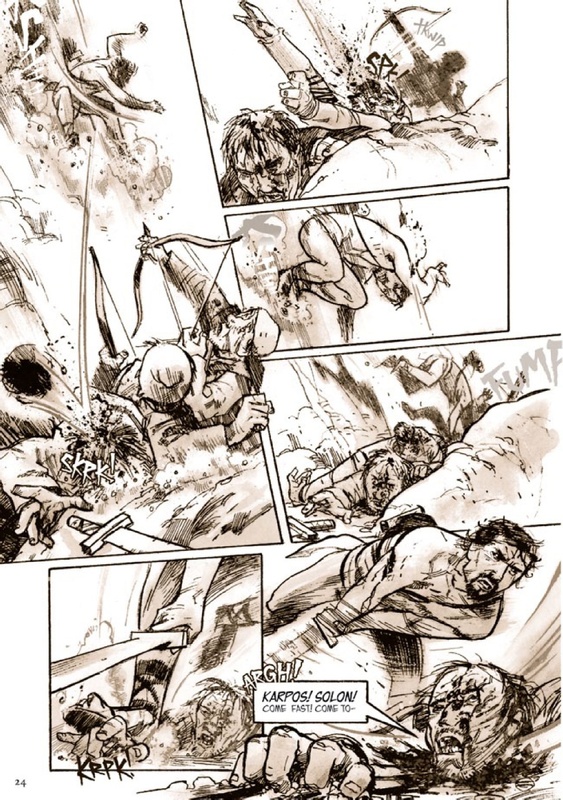 Luckily the story of the battle of Marathon and the sacrifice of Eucles is an engaging and moving story told extremely well by Boaz Yakin and illustrated by Joe Infurnari. Hippias, the disposed king of Athens, returns to the city with a large Persian force, conquering Greek city states along the way. Realizing their only hope is to enlist the aid of Sparta Eucles volunteers to run the 153 miles between Athens and Sparta. 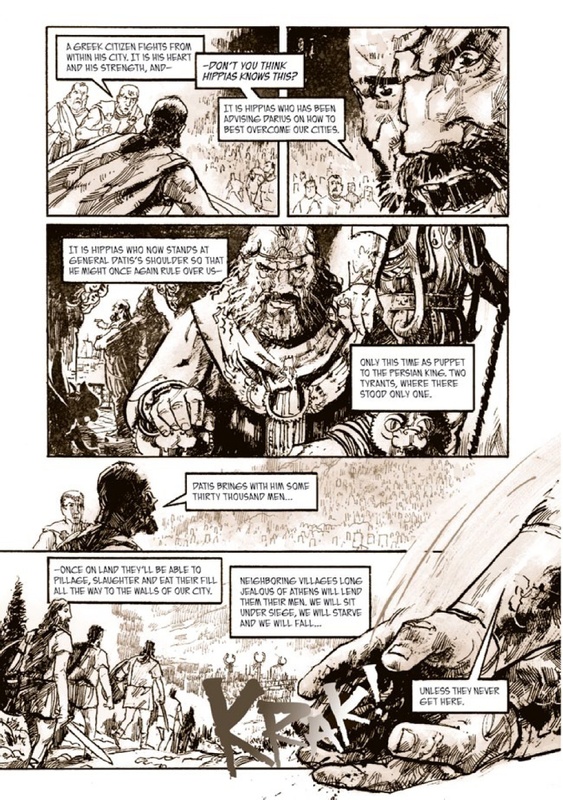 Denied aid Eucles runs to meet the Athenian army who has marched to meet the invading force at Marathon. The invaders are driven back but merely board their ships and set sail for the now undefended Athens. Eucles then runs from Marathon to Athens to rally the cities defence. That’s the summary of facts concerning the story, or at least as clear as they can be some 2500 years later; get more information at Wikipedia. Now we have the workings of a remarkable human interest tale of the endurance and willpower of one man, but Yakin goes far beyond that with a focus on Eucles and Hippias, weaving fiction around the bare bones of fact. As readers we’re shown what drive and determination can accomplish on either side of tyranny: Eucles and his run to preserve Athens and democracy and Hippias striving to reclaim his throne and enslave Greece. Both characters are unwavering in their goals and stop at nothing to accomplish them. They’re wonderfully developed through action and dialogue, utilizing a lot of strong emotions. Infurnari provides a wonderfully detailed ancient Greece through two colours; a hard black and a sandy tan. There’s a sense of dust and sand with every page. Costumes and environment appear detailed and accurate to my layman’s eyes. The real meat of the art comes through with Infurnari’s illustration of movement: the ship in the first page, Eucles engaging in combat in the second page and the close up of the hands in the third. And in the end that’s what Marathon is about: movement and its representation on the printed page. The artist pulls it off beautifully. No extras with Marathon; it’s a bit wider than the standard format and the paper is fairly heavy with a satisfying heft and sturdy binding for a softcover. At first blush I couldn’t see a story from the facts of the events but after reading Marathon a human element is engrained on these people and places, a face to the name.